Randy Seaver over at GeneaMusings.com has the Saturday Night Genealogy Challenge posted. This week is an ancestor scavenger hunt. My mission is to head over to familysearch.org, plunk down a name in the search box, then see where it leads me. As I’ve been working on Madeline (Mazeres) Menaud this week, I thought I’d try her husband, Romain Menaud. The surname is uncommon enough that I should get something targeted if he is in there. In my first search, I did name only without the boxes checked. My results: 625! Okay, that’s too many. And, from what I can see at a glance no Menauds. The name doesn’t look familiar, but since Menaud is an uncommon surname, I checked it to my database. Sure enough, it’s a match. 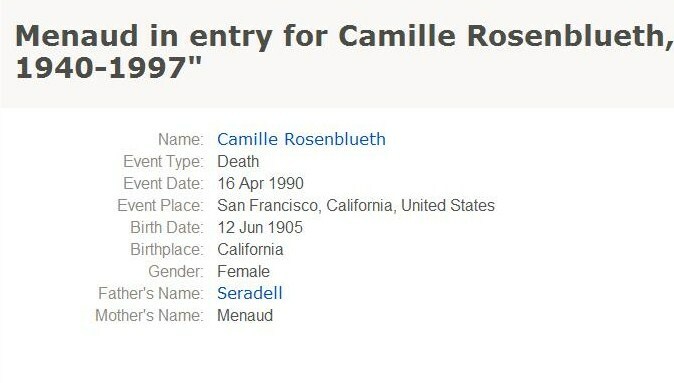 Camille is Camille (LaFortune) Rosenbleuth, the daughter of Leona (Menaud) LaFortune. She is the granddaughter of Romain Menaud and his first wife, Ambrosine ???. Although this person is connected to my tree, it’s not who I was looking for. I tried a different search: Menaud with the box checked and location as California. This gave me zero results. Okay, I see why. This location box only goes by country. Not really helpful in this case. I don’t need to see all the Menaud’s in the world, just the ones in California. This is from the 1900 census. It is my family, only the enumerator got all the names wrong. I blogged about it in this post “The 1900 Census got the Menauds all wrong“. My next search with Menaud and the box unchecked with Fresno as the residence didn’t do much better. Only 4 results were returned, the three above, plus a Japanese man going by the surname Munida. My next attempt was Menaud with the box checked and no locality at all. I wanted to see if a wider search did any better. Maybe I’d catch some misspellings. The results: 125 entries total. Most of the names on the first page weren’t close, so I didn’t bother on looking at the subsequent ones. My last attempt was to take a different tack. Romain Menaud was a native of France. This time I tried Menaud without the box checked and France in the birth box. This search gave me 94 results and they were targeted better than my previous searches. I ignored the first person because she lived in New York. The next three were from the census results listed above. The fifth entry was for someone in New Orleans. But, then things got better at number 6. The first entry is for Romain Menaud’s first wife. Looks like she remarried within weeks of her divorce to Romain being final. This is new information for me. The next five entries are my guy. Ramon was a common misspelling for Romain. These are all from the Great Registers (voting records). This is also new information for me. 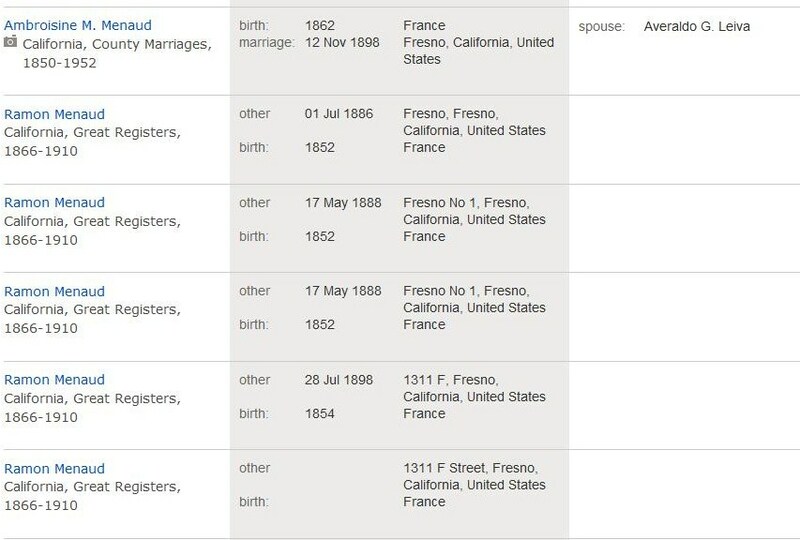 I am curious as to why the four entries did not come up in any other search, especially the one I did for Menaud with Fresno as the residence. I wonder if it’s because instead of “residence” Fresno is in the “other” field on this entry? Perhaps the search engine does not know these are the same since “other” could be anything. I’m a glutton for punishment, so I did one more search. I decided to see what would come up with Ramon (first name) Menaud (last name) with no boxes checked and no localities attached. I got the same five results as above, plus some other people who were obviously Latino. So, my scavenger hunt took quite a bit of scavenging before I found something interesting. I did pull up a death record on a descendant, a marriage record for Romain’s first wife, and a couple of entries in the Great Registers–all information that I didn’t have before. It took some finagling of the search boxes but I did eventually get something useful.